Interesting fact is that the Boxer breed of dogs has its roots in in Germany. The very first generation of these canines was bred and raised there. The country later exported this kind of puppets to different parts of the world and now there can be witnessed a sort of proliferation of the boxers. People love to have them as pets. They are cute and adorable in their appearance as well as with different kinds of amusing tricks they play all around. It might be a funny name to you but the fact is that these dogs do box in the real life. Yes, that is hilarious. They are called Boxers because of their natural tendency to act like they are boxing. Most commonly, it is seen that these canines can stand on their rear legs along with using the forelegs for sort of playing some boxing. It is this style prevalent in them that brings a unique feature into their breed. So, as you are aware now; never try to mess with a boxer. It can prove detrimental for your health. That can be a good and funny part of your selfie with the boxer. Yes, you can tame your pet to take out its tongue and get a selfie with you. It is because they really do have long tongues. Not all of them but common fact is that, most of the boxers are seen with long tongues. This makes the breed different from other dog types. People find it funny and strange seeing their lengthy tongues coming out of little mouths. Several tongue competitions have also been conducted among boxers. The winner with the longest tongue is given a handsome prize. It might be some sort of medical condition but mostly people believe the slow growth of boxers to be inherent in this breed. They are the canines which give you the longest possible puppy-hood. They remain adorable little puppies for a longer time and are not matured just in a couple of months. This thing takes years to accomplish the task. Boxer dogs do not have much large physique. So, it can also be the result of their gradual slow growing capacity. Whatever it is, people like to have them and there is a long list of celebrities as well who love boxer pets. It is must to know that the original breed from which the modern days’ boxers were bred is called Bullenbeisser. It is the breed that has gone extinct now. The reason behind this are not certain. Perhaps, the Germans can tell it better where these new puppets were bred for the first time. The extinction of the preceding type of boxers keeps a lot of secrets behind it. The dogs of this ancient breed were of greater physique than today’s boxer. The good thing is that, they were bred in time and the name of its ancestors remains alive. It should be obvious from the name of this famous breed of dogs. Of course; a boxer needs to be energetic. These dogs are well bodied and share a lot of energy in this. They can play, do exercise, run here and there throughout a day. Canines of Boxer breed rarely get much tired. This feature is a part of their hereditary. So, never underestimate the strength of your boxer pet and not be mistaken about their stamina. They can give you a tough time in the field. Better practice hard to win some race from your little cute boxer. No, don’t call them old. They are not aged. 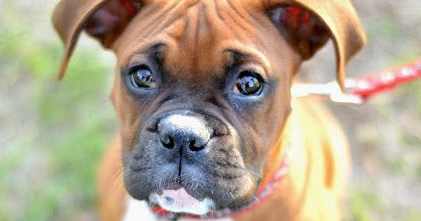 It is a feature in the breed of boxer dogs that they have wrinkly faces. This is because of the softness of their skin. Wrinkles on the face of a boxer often gives it a puzzled look. They are often called puzzled dogs because of the reason described. In fact, these pets are not puzzled but quite peaceful and lovely. They share a great sense of affection with the entire of the family they live with. So, don’t take the wrinkles wrong and try not to annoy them by calling ‘old guys’. Unlike other some other dogs, boxers are friendly to all the pets. There is no need to worry about any possible fight between your boxer and the other pet you brought home. Boxers tend to establish and maintain friendly relations with the other pets which are present around them. 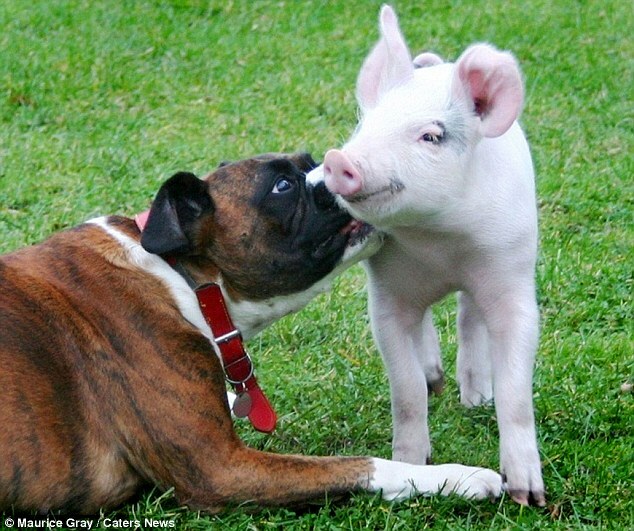 People often keep the boxer dogs as well as pigs in the same arena. They share friendly and healthy company. So, you need not to worry about any sort of unpleasant collision between your pets. Get a boxer and it will make good relations with all the pets which you are already rearing at home. It cannot be a coincidence. In fact, it is the cuteness and sharpness of these dogs that celebrities love them. Several big shots of the Hollywood have chosen boxers as their pets. It is also one of the reasons for their entry into the Hollywood arena of limelight has become easy for this type of canines. They have played several roles and people love them for their performance. So, if you have a boxer, you might also be a celebrity. Don’t be over excited; it’s just one side of the image. Now, go and take proper care of your boxer pet.